UPDATE: There have been several inquiries about the sleeve finish so the process is detailed at the end of this post (below the groundhog eating wolf). It’s been so long since there has been a new post at Janice Ferguson Sews that faithful readers might have thought that I was missing in action. I’ve been tending my dear husband who had knee replacement surgery two weeks ago. Post-op he spent a week at the same rehab center where I recuperated from my joint surgeries and gained some valuable insights into life. So I have been spending time with him, running errands and doing his many, many household chores. Whew! That man does more around here than I ever realized! He’s my grocery shopper, gardener, pool boy, morning feral cat feeder, garbage hauler, very best friend, and more. I have really missed him. At last, he’s back home, stepping lightly with his gentleman’s cane and walking the fast track to a complete recovery. That’s not really him. And it’s not really me. And I’m back too, with a finished project to share with you. This cheerful little dress just makes me grin. 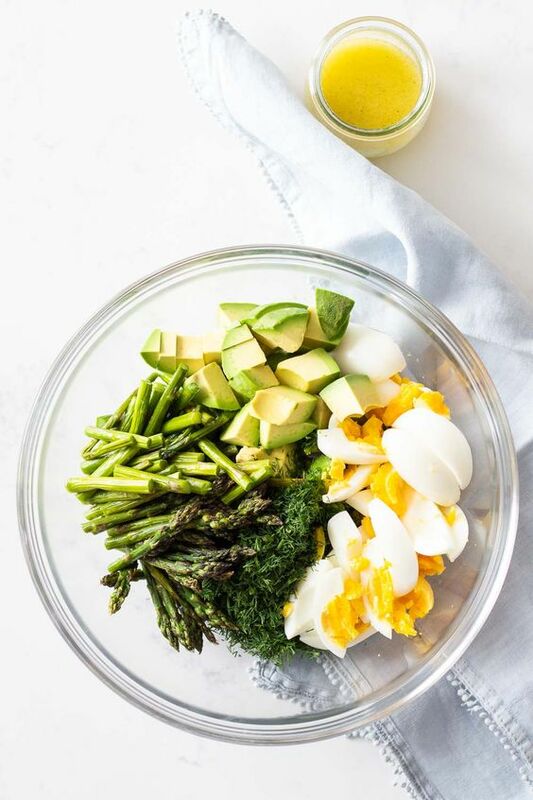 Looking at it reminds me of our Florida springtime with raspberry pink azaleas, white dogwoods and the bright turquois waters of nearby Blue Springs. The fabric says spring to me. Even here in our relatively mild central Florida climate, spring is something my whole family is anxiously awaiting. 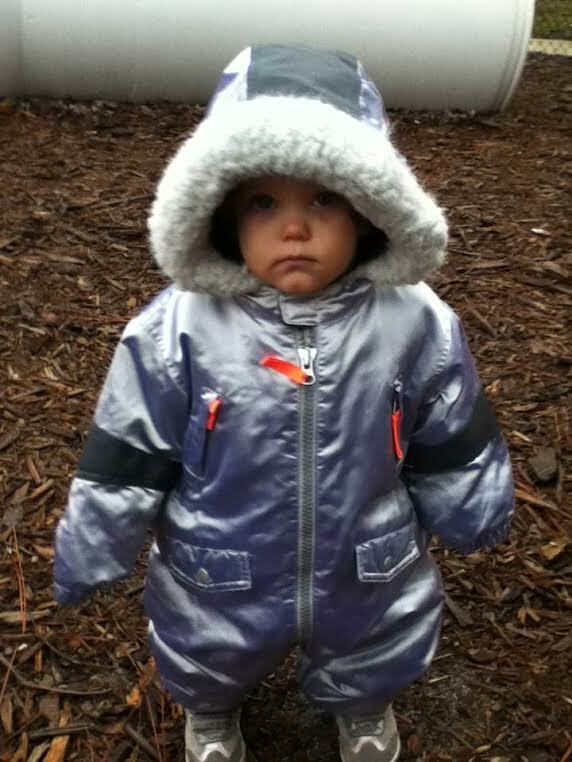 This is grandbaby Vivian Rose at the playground on a frigid 40 degree day. Can you tell what she thinks of cold weather? If Floridians are weary of rain and 30-50 degree cold, I can’t imagine how tired you Northerners are of bitter winter. But I digress–this post is not about weather. The Think Spring dress was cut out, pleated and ready to smock when I went with Rebecca and family to our cabin in October. Intended, of course, for baby Vivian Rose, the frock was smocked almost completely while we sat around the fire as the babies slept. When we returned home, the unfinished project was bagged up and put aside so I could start Christmas dresses. Now, almost 4 months later, I’ve grown tired of moving the ziplock from place to place in the sewing room. For me, having it out on the cutting table or the ironing board or on the shelf is safer than putting it away where it would have been forgotten (okay, okay—or lost. BACK OFF, all-knowing Judy D., Terry C., Suzanne S., Mildred T., and June M!). So instead of starting something new, I finished it. But I have forgotten the details–pattern, plate, etc. I probably used Children’s Corner Ki and added some trim to the front opening. My Children’s Corner Ki is a very old pattern–but still great. Note: I know Children’s Corner has reprinted and repacked their older patterns with color photos, but these yellowed envelopes are like old friends. Often when I pull one out, I remember making it for my daughter or for a gift. New color pictures can’t take me down Memory Lane. The main fabric itself makes me smile, as I recall memories and the tight bond I have with my stash. When I bought this print many, many years ago at Mary Jo’s Cloth Store (Paradise for sewists) in Gastonia, NC, my fabulous friend Suzanne Sawko and I were on our way home from a week-long sew-a-thon at our cabin, the same place that this fabric finally met floss and a #7 crewel needle. Suzanne’s taste has always been ahead of the times. She liked this piece, but the print did not appeal to me. 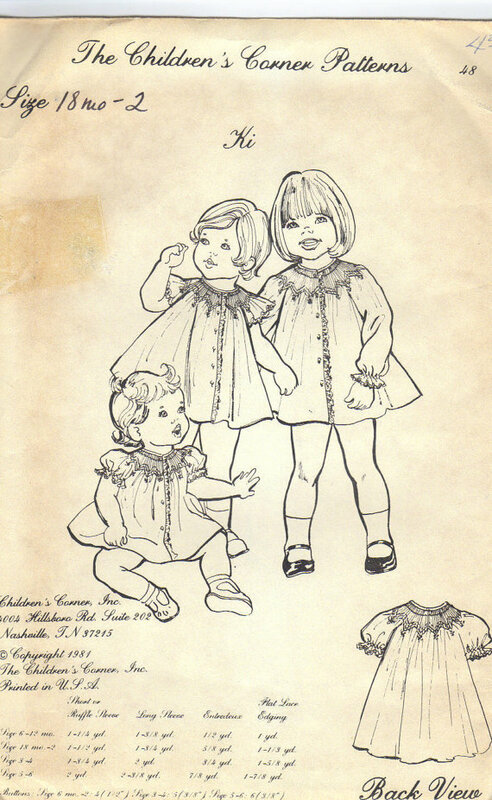 It seemed garish at a time when most classic children’s clothing was either pastel or primary colors. Now 15 or 20 years later, it seems very contemporary. Because I have a tendency to defer to Suzanne’s good judgement and because I loved the hand of this 100% cotton, it won me over. It is a creamy, soft yet serviceable, heirloom quality fabric with a weave like a baby twill, but very soft. The registration on the print is crisp, almost like a Liberty tana lawn. Oh, and did I mention that it was on sale–always a strong selling point. So it came home with me, in a Mary Jo’s bag with yards and yards of other fabrics that called my name. Raspberry pima gingham trims the front, angel sleeves and neck line. The Swiss trim is my all-time favorite, with the large entredeux holes next to smaller ones through which I like to weave floss. I bought a ton of this from Martha Pullen less than a year ago, but have used all but a yard of it. Wish I could get more. Tomorrow, I’ll whip up some bloomers. Now Vivian Rose has a dress for spring or for these cold Florida days if she wears a long sleeve white shirt and leggings under it. But not to worry. I’ve heard that a wolf has taken care of the weather. Sleeve finish: The raw edge of the angel wing sleeve was encased in double fold raspberry bias. It was first stitched on the wrong side, then wrapped around to the front and secured with a tiny zig zag (L 1.0 W 1.0) using monofilament thread. The Swiss trim was trimmed to the edge of the entredeux and then butted to the folded edge of the raspberry bias on the sleeve. It was joined to the gingham with white 80 wt. thread and another tiny zig zag. I don’t recall the settings, but it was just enough to go in each hole and still penetrate the folded bias. Finally, the floss was woven through, after the Swiss was joined to the sleeve. Voila’! Let me know if this isn’t clear. 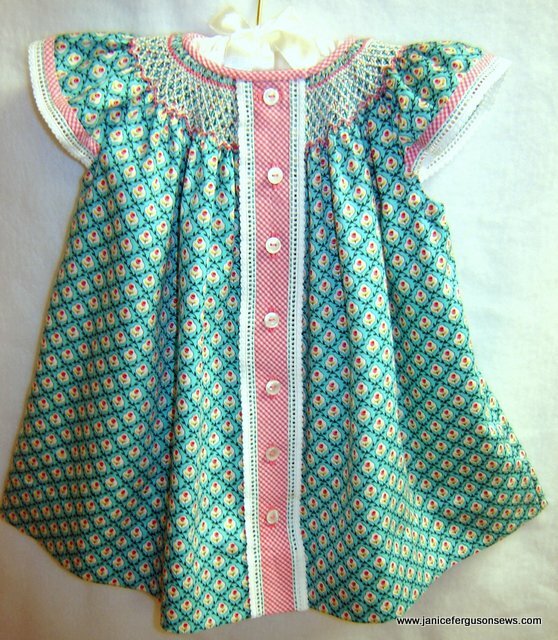 This entry was posted in Basic no-embroidery Machine Projects, girls, heirloom sewing, smocking and tagged heirloom sewing, smocking, toddler smocked dress. Bookmark the permalink. 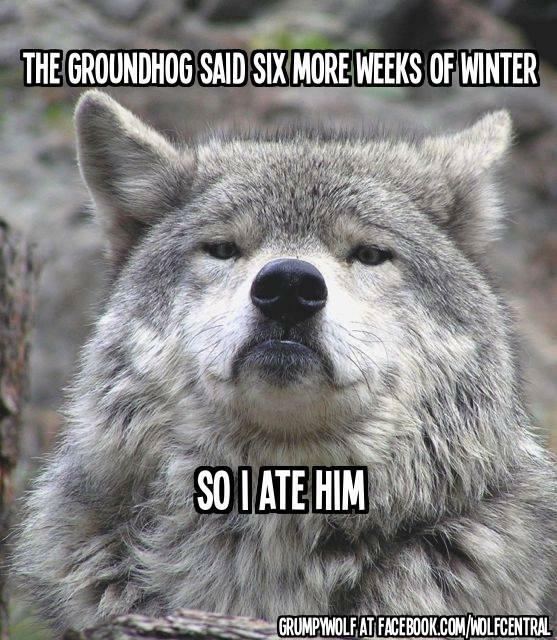 Thanks for the chuckle from the wolf this morning! Every time I see something smocked, I am reminded that a smocked Bishop is lurking on my bucket list. I still hold out hope…. I enjoyed your post this morning. Thank you. And best wishes to your husband on his recovery. Janice – this definitely says spring. And I’d take your pretty balmy sounding 40 degrees any day. Up here in Canada, we’ve been enjoying a pretty solid stretch of -20 C (that’s around 0F), plus lots and lots of snow. Spring is still a long way a way, but this dress brings it a little bit closer! Jo, I just can’t believe how old this fabric is and how “now” it is now. I’m complaining about our weather, but yours must be bone chilling. Keep warm! Claire, I have experienced Canadian winter first hand. We moved to Ottawa in August, 1974, when I was 6 months pregnant with our first child. And like the Princess and the Pea, one cold snap in September convinced me that I am a Floridian to the core. We fled back to our home 6 months later in Jan. 1975. You must be very tough, because you have to be in order to endure that weather. We were there in the spring of ’74 on a house hunting trip and I do recall vividly the breathtaking beds of tulips and crocuses. You have a beautiful spring ahead. Cheryle, I’m glad you enjoyed this post. And about your bucket list bishop, just do it! They are easy and addictive. My bucket list includes many of your gorgeous projects. I love your facebook page and etsy shop Such wonderful projects! Oh, Janice, I had to smile when you mentioned how old this fabric is! I, too, have favorite pieces of fabric ‘mellowing’ in draws and cupboards waiting for grandchildren for whom to use them. Sometimes (just sometimes) I feel guilty for not using the favorites for the children of friends I know now and dip into that stash but there is plenty of other fabric in the Big Stash! This little dress is just delightful and I love the contemporary look the print and the bright raspberry gingham give the dress. Would you mind detailing how you did the pretty sleeve edges? Is the Swiss edging hand sewn to the gingham bias binding? 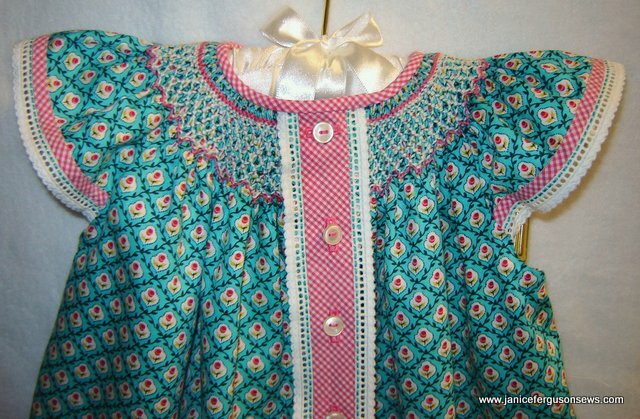 I look forward to posted photos of Vivian Rose wearing this darling dress! Blessings for a speedy recovery for your dear husband! Karen, this was not a favorite piece of fabric and it was aging until it was “in style.” But I do still have some specially saved pieces that I must get made up before Vivian Rose is too big for them. Don’t feel guilty about those fabrics you have left to mellow–everything you make, even taken from your regulation stash, is just gorgeous. A few people have had questions about the sleeves so I will add a few paragraphs to the blog post FYI. Thanks for your wishes for my husband’s recovery. I am just soo (not sew) glad to have him home and doing so well. Janice, this is beautiful! The little print is lovely and all the details make it a yummy confection! 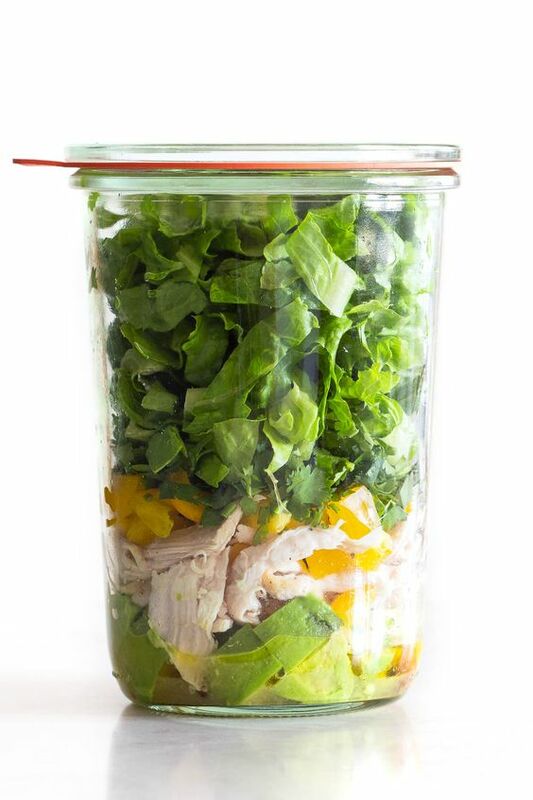 Do you have a tried and true method for making such perfect bias? I really like the pairing of the gingham with the print, I don’t have the eye for that sort of thing. 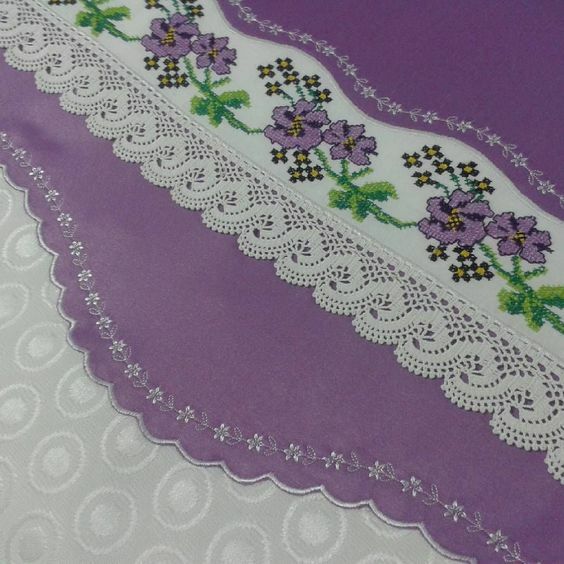 The Swiss embroidery is just perfect, especially with the floss woven through it. The whole affect is just adorable, and you’re right, quite contemporary. I used to live in Ohio (So Cal now), and that first winter I bought an electric blanket. How I hated the snow and slush, then the frozen black ice. The wolf has the right idea. Janice, how I wish I had your eye, or your friend Suzanne’s to pair fabrics. I love many of the modern fabrics but I still tend to play safe. My husband who worked for the BBC had a very good eye for colour and fabric matching but alas he died last year so it’s up to me now. I love the special finishing touches to all your things, the Swiss edgings and the embroidery silk threaded through- these details make such a difference to the look of the finished garment. I wish your husband a very speedy recovery- he must be huge help to you. Thanks, Cynthia. Weaving floss through entredeux holes adds such a nice little pop of contrast, IMHO, so I do that often. Aren’t you glad to live where you do? Some people are cut out to live in and love the cold weather, but you and I are not those people! I loved the wolf pic, though it looks more like an Akita to me. Pamela, I’m sorry your husband isn’t around to advise you on fabric pairing, and for all the other things for which we love our husbands. Thanks for your kind wishes for my guy’s recovery. We expect that at this rate, he will be full steam ahead soon. Donna, I just use my rotary ruler, cutter and mat to cut true bias. Then I use these handy little Clover bias makers, which come in sizes from teeny tiny to a huge 2″. Before I came across these, I was relatively happy with Elizabeth Travis Johnson’s method of pinning a straight pin to the ironing board and running the bias under the pin, folding it as it approached the pin and then ironing as it passes under the pin. Of course, you had to get the available space under the pin just the size you wanted for the finished bias. Only when I was preparing kits for a class I was teaching at Sewing at the Beach and needed–I don’t know, maybe 5-7 yds. of bias for each of 25 kits– did I get the bias makers because they made the process quicker. Is this at all clear? Another pretty dress for the beautiful Vivian Rose. She has such an expressive little face. Thanks, Sue. Don’t you just love that picture of Grumpy Vivian Rose? You are so right–she has a very expressive face. 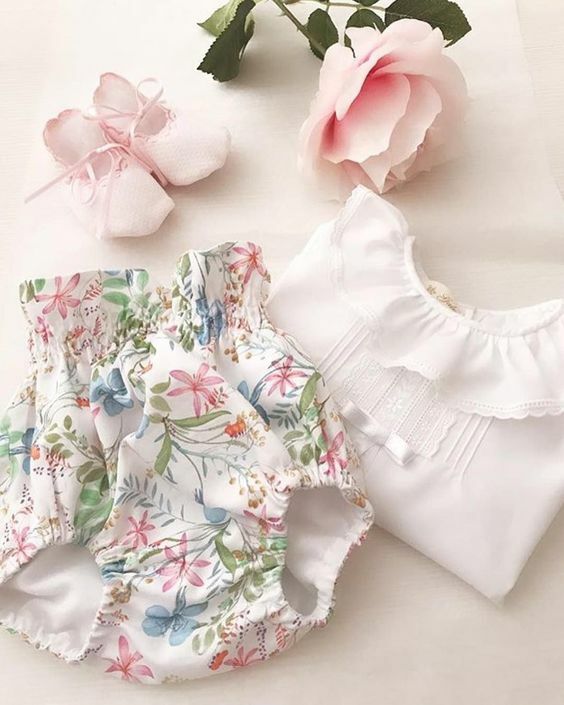 from SewForum: Sweet fabrics and a cute pattern – so much detail in small package. Lucky little Vivian Rose. 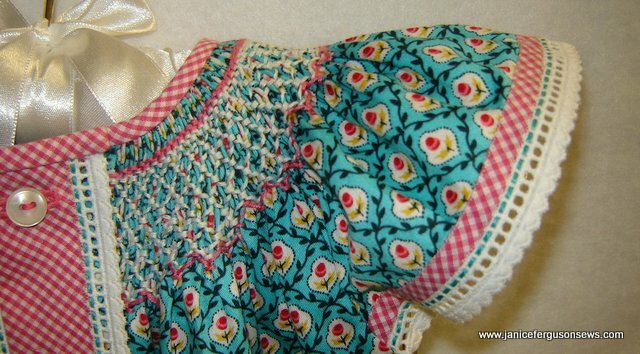 from Martha Pullen smocking forum: What a delightful dress…love the colors and your choice of raspberry gingham with the print. It’s perfect. It appears that Vivian Rose will be much happier when she can comfortably wear this darling dress instead of her heavy jacket! Hope your DH’s knee heals quickly–it’s tough when the other member of our team is out of commission, but it reminds us how important we are to each other. Thank you for the details on those pretty sleeves. I thought that might be how you did it but I was surprised by the monofilament thread. How long does that type of thread last? I’ve always wondered if it could take the heat of a dryer and an iron and not crack after several ‘go-rounds’. I’d like to use it but have been afraid. Is this a thread you use routinely? I have purchased some but haven’t given it a try yet. Is this trim no longer available from MP? It looks wonderful! I would love to locate some of it!! Genna, I can’t find this trim on the MP site but haven’t yet looked elsewhere. I love it too! Let me know if you find any and I will do the same for you. Thanks for reading my blog.